My Dog Says Woof! : It's National Microchip Your Pet Day! It's National Microchip Your Pet Day! My dog says that today is national Register Your Chip Day! Not potato chip, but microchip! 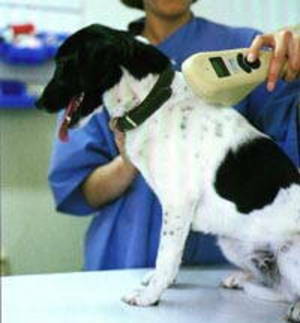 52.2% of microchipped dogs are returned to their owners, versus 21.9% overall (238% better with a microchip!). 38.5% of microchipped cats are returned to their owners, versus 1.8% overall (over 2000% better with a microchip!). Fewer than 2% of all stray dogs and cats in shelters have microchips. Lost pets who had a microchip were reunited with their families in almost three out of four cases. 35% of microchipped pets who were not reconnected with their families remained in shelters because their the owner had not maintained the information on the chip (e.g. incorrect or disconnected phone number). Your companion animals depend on you for their safety. In addition to a traditional ID tag, get your pet a microchip! Better safe than sorry. Microchipping for companion animals is pretty standard these days. In my city, all the shelter animals are microchipped before they go to their new homes. It's a powerful tool in helping to reunite lost pets with their families. During the Katrina disaster in New Orleans, animals who were microchipped made it back to their owners. Animals who were not, didn't. ID tags can fall off. A microchip is just another tool to guarantee that your pet can be reunited with you safely.